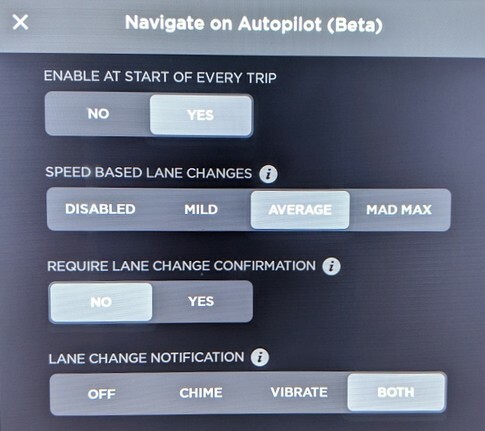 With the 2019.8.5 software update in early April, Tesla has begun rolling out a major Autopilot update that greatly enhances the Navigate on Autopilot feature, now allowing customers to turn off Confirm Lane Change. 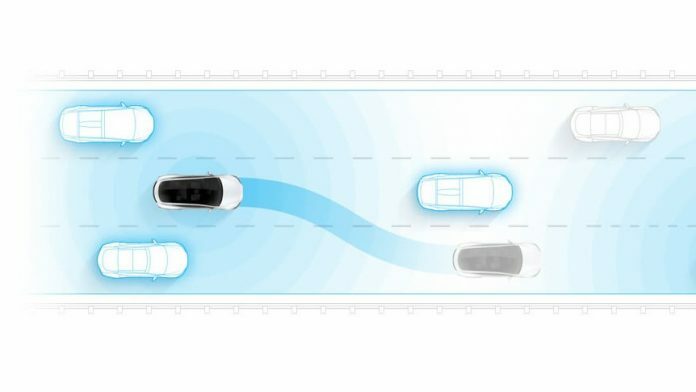 With no lane change confirmation required, Tesla vehicles with this capability can now truly drive autonomously from freeway on-ramp to exit. 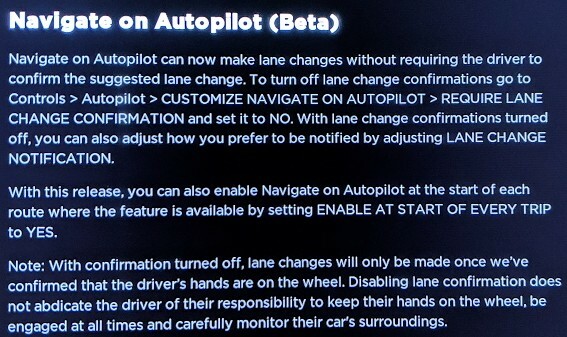 Note that this feature is available for those customers who currently have the Navigate on Autopilot feature and for those who have purchased the current Full Self-Driving (or Enhanced Autopilot) packages. Enable at Start of Every Trip – this will automatically turn on Navigate on Autopilot once a destination has been entered that has a compatible freeway route. Require Lane Change Confirmation – a user can select “No” for this option and the vehicle will automatically change lanes when safe to do so and when the users hands are detected on the wheel. Lane Change Notification – this allows a user to be notified of an upcoming lane change via an audible alert or a steering wheel vibration (if your vehicle was built after August 2017). Users can cancel a lane change by before it’s made by moving the car’s turn signal or pressing the lane change notification cancellation button on the touchscreen. Tesla says they have thoroughly tested this feature with over a half-million miles driven with the confirmation turned off. Even before that, Tesla logged millions of miles with Navigate on Autopilot to understand exactly how well lane change suggestions worked in order to adjust the system for the rollout. As usual, this rolls out with an over-the-air software update starting in April. It’s available for US customers only at this point and will come to other markets in the future. It first rolled out with the 2019.8.5 update but be sure to check the Software Updates page for the latest. See the full Tesla announcement here.